Well, by complete accident and lack of intentional forethought on culinary planning, this is my second recipe post this week! Lucky you! (Can you tell that my new year's resolution to "reduce" my waistline is really working so far?) Oh well, it's my birthday week, so I'm eating all my favorite foods and I figured I might as well share them with you, while I'm at it. I'm super generous like that. You can thank me later. 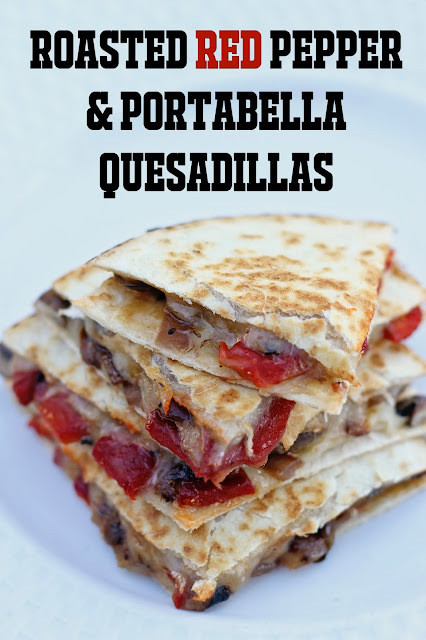 Today I'm sharing a recipe that I consider one of my best "sports-watching" recipes - Roasted Red Pepper and Portabella Mushroom Quesadillas! The BIG GAME is coming up soon, so if you're looking for a great recipe to add to your lineup, this is it! These quesadillas are hearty and delicious, but not overly filling or fattening. They're vegetarian (although would be great with chicken as well) and packed are with flavor, color and cheesy goodness. I first had a similar quesadilla at my favorite little Mexican restaurant and have been hooked ever since. I've made these a couple dozen times for football games, parties, tailgates and dinner and think I have it mastered. I usually make them ahead of time and keep them warm in the oven. They're also super easy to reheat (and stay crispy) in the oven or toaster oven. And if all else fails, they are still delicious cold. 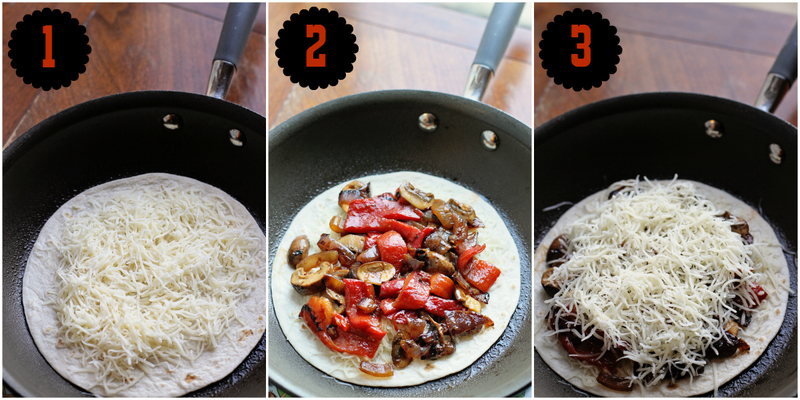 The ingredients are really simple: roasted red peppers, portabella mushrooms, red onion, swiss cheese and tortillas (plus a little salt and evoo for flavoring). I chop the veggies up and begin by caramelizing the red onion in a skillet with some evoo. Once the onions are browned and caramelized, I add the peppers and mushrooms and cook until the mushrooms are soft. 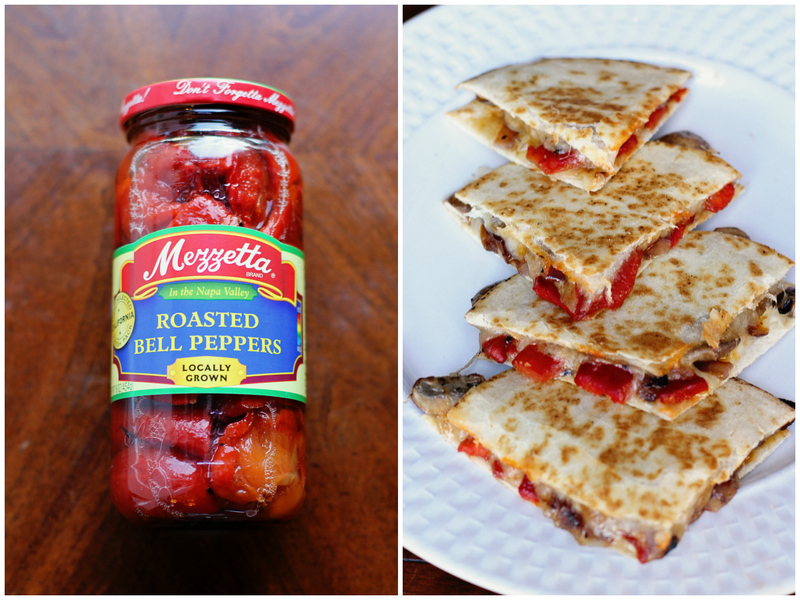 I love using the the jar of Mezzetta Roasted Bell Peppers because it's so simple and they're so good! They have that great smoky/roasted flavor and you can even see the char marks on them. Plus, they're so bright and colorful - it really makes your food look amazing! Make sure to drain the red peppers, but do not wash them! You don't want to lose any of that roasted flavor. When all your veggies are cooked, add a healthy sprinkling of salt and remove them from the skillet. Spray your pan with nonstick cooking spray and add one tortilla. Add a layer of shredded swiss cheese, add the veggies, top with another layer of cheese and then the final tortilla. The two layers of cheese ensure that the tortillas will stick everything together and it won't fall completely apart. Trust me, I realized this the hard way. Plus, you can never have too much cheese in a quesadilla! Once your bottom tortilla is brown and crispy, flip it over and cook until the other side is crispy. And then cut into triangles with a pizza slicer and enjoy! 1. Add evoo (maybe about a tablespoon) to skillet and saute red onions over medium high until caramelized (they should be a rich brown and soft, but not mushy). 2. 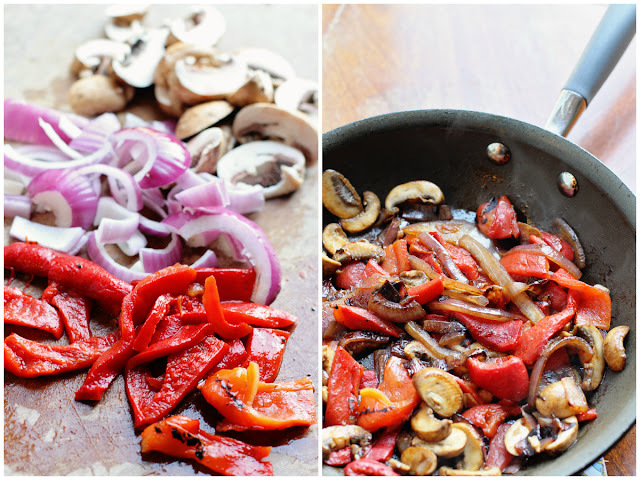 Add peppers and mushrooms to onions and cook until mushrooms are soft and flavors have combined. Add a heavy pinch of kosher salt and combine. Remove from skillet. 3. Spray pan with cooking spray and add 1 tortilla. Top with a layer of cheese, followed by a layer of the veggies and topped with another layer of cheese. Add final tortilla. 4. Cook one side until crispy and browned. Flip. Cook other side until crispy and brown. 5. Serve with guacamole or sour cream. If you’re interested, Mezzetta is hosting a Homegating where you could win a fabulous prize pack that includes a 55” 4K LED TV plus the Mezzetta Homegating Party Pack (Mezzetta branded football, blanket, pint glasses , cooler, party tray, cocktail napkins, and a jar each of Mezzetta Whole Golden Greek Peperoncini, Deli-Sliced Tamed Jalapeños, Deli-Sliced Mild Pepper Rings, Sliced Golden Greek Peperoncini, Roasted Bell Peppers and Deli-Sliced Roasted Bell Pepper Strips). You can enter HERE. Yummmy, this recipe looks so delicious! Just think of it as "reducing" eating out! This looks delicious and as a girl who rather set the kitchen on fire than cook in it - well I think I could manage this! Oh goodness, these look so delicious! My mouth is literally watering right now...feed me! I'm starving!! On my list for the Packers game tomorrow! Actually made it tonight! Sooooo good! This has several of my favorite ingredients, so I'm not sure why I never thought to combine them all into a quesadilla before. Always looking for yummy, easy, veggie meals that maybe, just maybe, the picky toddler will actually eat. Thanks for sharing! These look so good!! I love Mezzetta peppers. They are full of flavor and add so much to a dish. Adding all of these ingredients to my shopping list so that we can try this soon! Looks delicious. Thank you for sharing!! Ok these seriously look amazing! But I think all your recipes are fabulous, so excuse me while I pack my bags and move in! You collected some very beneficial and delicious ingredients in this food so i will try it after finishing work with essay writing for university students. The recipe of this food is very easy so must try to make it with the use of these ingredients.